John Maxwell is a nationally respected expert in leadership. The Maxwell Leadership Bible Notes provides an in-depth look at God’s laws for leaders and leadership. Plus, this 2nd edition includes new updates. 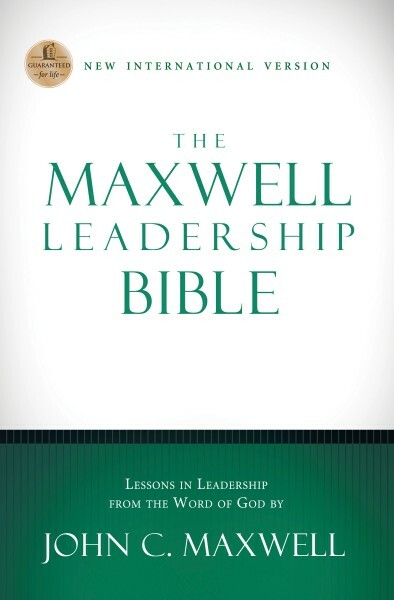 The Maxwell Leadership Bible Notes offers principles of leadership that will greatly impact the way you guide others. John Maxwell believes the God created all of us to be leaders/influencers at some level. The principles for leadership in this book can be applied in everyone's life and every type of relationship, to become more effective in God's kingdom. In Maxwell Leadership Bible Notes, Dr. Maxwell explains what a godly leader is and how God is glorified when you accept the role you’re called to. It includes great articles and insights that will become an invaluable part of your leadership library. You’ll find 21 Irrefutable Laws of Leadership and 21 Indispensable Qualities of a Leader with lessons about Biblical characters who exemplified each. Over 100 biographical profiles feature stories that share God’s truth about leadership. These Notes offer supplemental information on the following topics: Leadership Laws, Servanthood, Teachability, Vision, Control, Convictions, Correction, Credibility, Criticism, Decision Making, Delegation, Discipline, Encouragement, Equipping, Ethics, Planning, Power, Practicality, Pride, Priorities, Purpose, Responsibility, Restoration, Spirituality, Standards, Stewardship, Submission, Teamwork, Tolerance, Trust, Values, Wisdom"
The quoted verses in the Maxwell Leadership Bible Notes are from the New International Version.